A meeting of top U.S. and Chinese diplomats got off to a frosty start on Monday, with U.S. Secretary of State Mike Pompeo and Chinese Foreign Minister and State Councillor Wang Yi airing grievances amid worsening bilateral relations. While the exchange included typical diplomatic pleasantries, and the two officials emphasized the need for cooperation, their remarks before journalists at the start of their meeting at Beijing’s Diaoyutai Guest House were unusually pointed. “Recently, as the U.S. side has been constantly escalating trade friction toward China, it has also adopted a series of actions on the Taiwan issue that harm China’s rights, and has made groundless criticism of China’s domestic and foreign policies,” Wang said at the joint appearance with Pompeo. “We believe this has been a direct attack on our mutual trust, and has cast a shadow on China-U.S. relations,” Wang said. “We demand that the U.S. side stop this kind of mistaken action,” he said. A senior U.S. State Department official said the United States still expected cooperation with Beijing on efforts to denuclearize North Korea, whose chief ally is China. 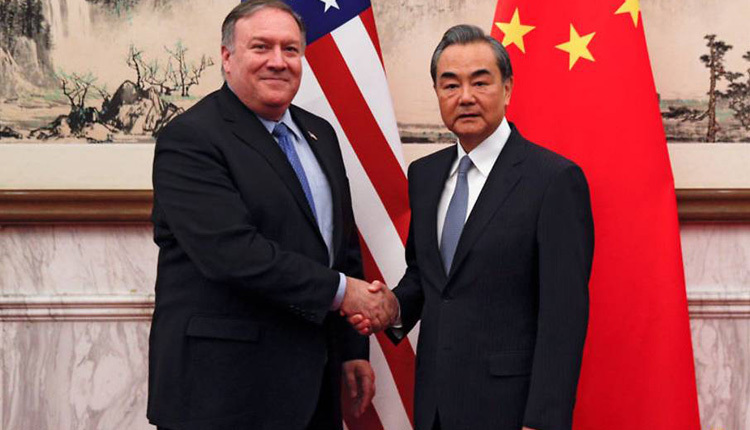 Pompeo and Wang openly disagreed over which side had called off a bilateral security dialogue that had been due to take place in Beijing this month.